Hats off to Western Mindanao State University! As the WMSU Juggernauts/Hawks soared the highest in the recently concluded Inter-school Cheerdance Competition, the College of Architecture (CArch) Dean and the WMSU Jambangan Dance Troupe were conferred the prestigious Culture and Arts awards. In consonance with the “Dia de Zamboanga” in commemoration of the 73rd Charter Anniversary of the city, the local government staged the Cheerdance competition held last February 23 and spearheaded the annual Awarding Ceremony dubbed as the Achievers’ Night held last February 25. The Cheerdance competition caught the spectators’ attention brought by artistic and flexible stunts where the WMSU Juggernauts/Hawks bested other schools in the city to include Pilar College, Ateneo de Zamboanga University and AMA Computer College which placed 2nd, 3rd and 4th respectively. 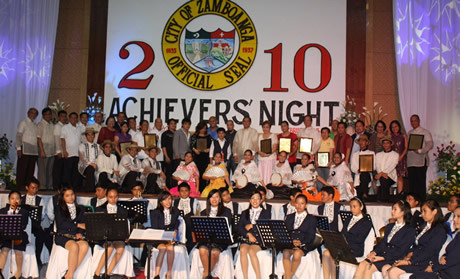 Meanwhile, the Achiever’s night honored Zamboanguenos who have rendered remarkable contributions and given the city pride and prominence in 2009. CArch Dean, Architect Domingo A. Abarro III received the award for his achievements in the field of visual arts. A true-blooded Zamboangueno, Abarro has contributed immensely to the city’s thrust for progressive development, not only as an academician but as a practitioner as well. This is the 2nd time he was handed up with this kind of award when in 2005, he likewise received the Achiever’s award falling under the Academe category. “My honor is also the University’s honor and thank you for your continued support to the College of Architecture,” said Abarro, expressing deep gratitude to the university. On the other hand, the WMSU Jambangan Dance Troupe has been an “Ambassador of Goodwill” in dance since its founding in July 1969 whose main thrust is to promote the Filipino culture, specifically the culture of Zamboanga. 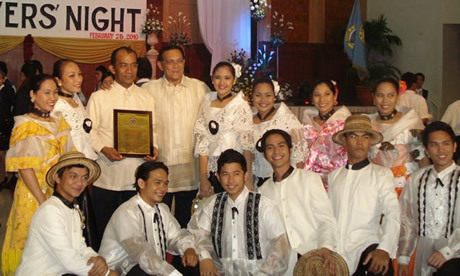 Last year, the dance troupe staged a 1 – hour dance production dubbed as “Zamboanga: In Dance and Music”; performed with other top dance companies in the Philippines and other countries during the International Dance Exchange in Dumaguete City; and represented the city during the WOW Philippines: Zamboanga Night ( Cultural Presentation) in Intramuros, Manila. With all these great contributions not only in the city but in the entire country as well, the WMSU Jambangan Dance Troupe is, sure enough, this year’s achiever in the category of Performing Arts. In a related development, WMSU through the College of Science and Mathematics also spearheaded the Crimson Mania showcasing some of Zamboanga’s great talents namely Armarie Cruz, a Philippine Idol finalist, Robert Nadera, a contestant of the famous Talentadong Pinoy, and Poy, a Pinoy Dream Academy finalist. Crimson Mania was not only a miniconcert but a fashion show as well graced by Zamboanga’s top models dashing on the catwalk. Truly, WMSU is not only a carver of knowledge and skills, but a purveyor of the city’s progress and development. With all these achievements, we have all the reasons to celebrate and all the reasons to beam with upwelling pride. Again, hats off to WMSU!